Pregnancy is billed as a beautiful experience punctuated by simple joys like feeling the first kick or picking colors for the nursery. But complications can sometimes create stress for soon-to-be parents. Cleveland Clinic experts offer state-of-the-art care and emotional support to families facing underlying medical conditions, difficulties with poor pregnancy outcomes, or suspected or known problems with mother or baby. The following check list can help you determine if could have a high-risk pregnancy. Women over 35 years old are at increased risk of giving birth to a child with a chromosomal anomaly. Any pregnancy can become high risk. You should call your caregiver immediately if you experience any vaginal bleeding, a leakage of fluid, pain in the abdomen or shoulder or painful, urgent urination. For more information on pregnancy and fertility, download our free Infertility Treatment Guide. Cleveland Clinic’s unique team-based approach gives women who seek care for pregnancy-related complications many advantages. 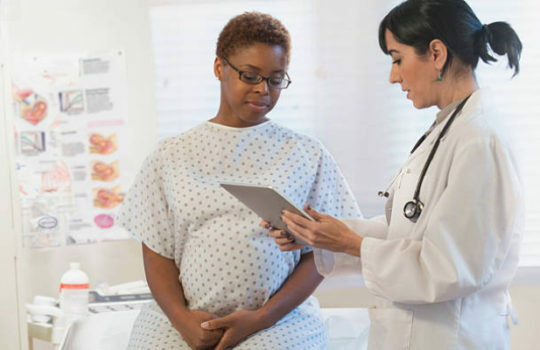 Women who have significant medical problems and/or history of serious pregnancy complications benefit from careful planning and appropriate treatment prior to pregnancy to prevent or significantly decrease the risk for problems. Women carrying babies with known or potential health issues have immediate access to experts in the care of newborns, including neonatologists, pediatric surgeons and subspecialists, who can ensure the best possible outcome. For example, if a baby has been found to have a heart defect, Cleveland Clinic’s team includes pediatric cardiologists and cardiac surgeons who will help further counsel the family prepare them for the child’s care after birth and provide any necessary intervention. Understanding the importance of the bond between patients and their physicians, the Maternal-Fetal Medicine team strives to keep in close contact with the referring OB/GYN by communicating regularly over the course of the pregnancy. In certain situations, when the severity of the mother or baby’s condition is particularly threatening, the patient’s care can be transferred to Cleveland Clinic. The Maternal-Fetal Medicine team includes perinatologists, genetic counselors and medical geneticists, neonatologists (experts in the care of newborns), pediatric surgeons in a variety of subspecialties, licensed sonographers and perinatal nurses. They offer comprehensive care in a warm and supportive environment close to home, with offices throughout Northeast Ohio. To schedule a consultation, please call 216.444.6601.